Moving the Needle: Austin Kearns turns the game on its head with a three-run blast, +.527 WPA. The Indians and Yanks had been through a game like this before, where A.J. Burnett pitched well, but the Yankees couldn’t score. This time, however, they broke through first, going up 2-0 in the top of the seventh. Burnett came out for the bottom half and got two outs, but then the wheels fell off. Shelley Duncan singled home a run, and Kearns followed that with a huge homer, putting the Indians up 4-2. Curtis Granderson: 1 for 3, 1 HR, 1 BB. His homer made it 4-3 in the eighth, but the Indians squelched that rally in the bottom half with a two-run homer. Josh Tomlin: 7 IP, 3 H, 2 R, 1 BB, 5 K. The only three hits he allowed came in the seventh, but they were big ones. 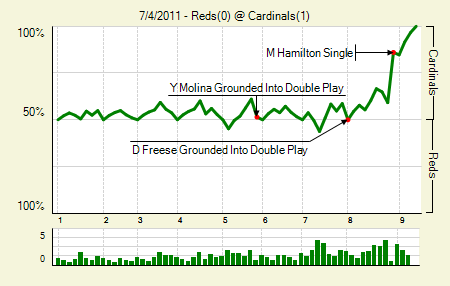 Moving the Needle: Victor Martinez grounds into an inning-ending double play with the tying runs on base, -.120 WPA. 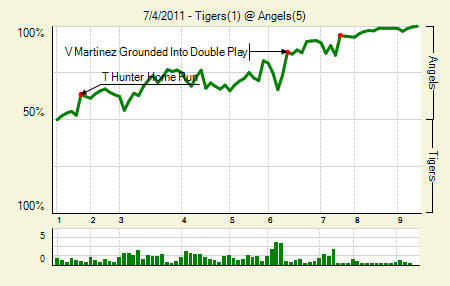 The Angels picked up their runs one at a time, giving the Tigers a few chances to catch up throughout the game. Their best chance came in the sixth, a half inning after the Angels had jumped ahead 3-1. They started the inning with a single and a walk, but two batters later Martinez grounded one to second, ending the threat. The Angels repaid them by adding another run in the bottom half. The Tigers suffered another inning-ending double play the next inning, again with two runners on base. Vernon Wells: 2 for 4, 1 2B, 1 HR. He’s been better than earlier in the year, clearly, but even counting his four-game hit last week he’s still just 7 for his last 30 with three homers, two doubles, and no walks. Joel Pineiro: 7 IP, 5 H, 1 R, 3 BB, 1 K. The three walks are a rarity for Pineiro, whose resurgence has depended greatly on low walk and high ground ball rates. He did get 12 grounders. 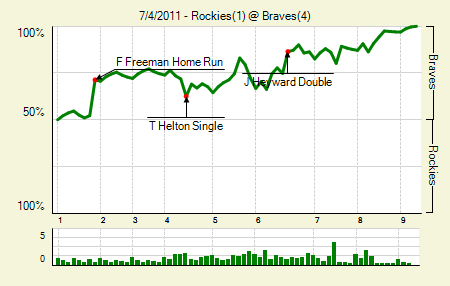 Moving the Needle: Freddie Freeman opens things up with a two-run shot, +.192 WPA. With none on and two outs in the first Brian McCann singled. Freeman then stepped up and worked the count full before hitting the ball deep the opposite way, clearing the fence in left-center for a two-run shot to give the Braves an early lead. The Rockies added one a few innings later, but the Braves pulled further ahead in the sixth, and then Freeman added some insurance with a solo homer to lead off the eighth. Jason Heyward: 1 for 4, 1 2B. After watching his run-scoring double, I’m shocked that they didn’t give him an RBI. Sure, Jonathan Herrera dropped the ball, but McCann was on his way home and I’m not certain, at least from the replay, that the ball would have beat him. Tommy Hanson: 7 IP, 4 H, 1 R, 1 BB, 6 K. Has given up zero or one run in seven of his 16 starts. Moving the Needle: Jacoby Ellsbury leads off the ninth with a single, bringing the tying run to the plate, +.096 WPA. 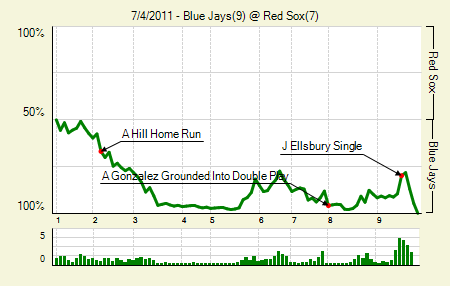 By the end of three the Jays led 7-0, but even that lead isn’t necessarily safe at Fenway Park. The Sox came back for four in the fifth and then three in the eighth. Luckily for the Jays, they picked up one in the seventh and then another in the eighth to lead 9-7 lead heading into the ninth. The Sox started the bottom half with the top of the order, and Ellsbury got things started with a single that snuck past Aaron Hill at second. I’ve seen the Sox mount such a comeback, and I’ve seen Frank Francisco blow a game, many times before. My official prediction at the time was a Pedroia walk and Gonzalez walk-off homer, and it looked pretty good after Francisco fell behind the former 3-0. But he came back to log the strikeout, and then did the same to Gonzalez. One last strikeout ended it, giving the Jays victory. Aaron Hill: 3 for 5, 1 HR. It took him until May 29th to hit his first homer, and this was just his fourth on the season. His season is still going crappily, just without the power he’s shown in the last two seasons. Travis Snider: 3 for 5, 3 2B. In his first game back from the minors, no less. At least the Blue Jays have realized their position and are giving Snider another chance. Jacoby Ellsbury: 4 for 5, 1 3B. Surprisingly, it was just his first triple of the year. Moving the Needle: Michael Martinez brings home the only run, +.140 WPA. The Phillies had one good threat earlier in the game, with two on and one out in the third, but for the most part the two teams were quiet. In the seventh Domonic Brown got things started with a single, and then moved to second when the next batter drew a walk. Martinez then lined one over the shortstop’s head, but right to Bryan Petersen in center. He made a good throw home, and John Buck applied the tag, but it was up at Brown’s chest, while his foot had already hit the plate. Just three times the Marlins got a runner even to second base in the game, and none came via hits (one sacrifice and two stolen bases). Vance Worley: 7 IP, 2 H, 0 R, 2 BB, 6 K. His performance this season has been a pleasant surprise as the Phillies, the poor Phillies, have had some injuries in their rotation. His low home run rate, 0.37 per nine, is really holding things together. Ricky Nolasco: 7 IP, 6 H, 1 R, 2 BB, 4 K. As with Worley, Nolasco’s numbers this season are heavily reliant on a low homer rate. Yet his ERA is still well ahead of his FIP (3.39) and xFIP (3.47). Moving the Needle: Adam Dunn homers (!!) to put the Sox ahead, +.447 WPA. While a .171 batting average is low, even for Dunn, the main component missing from his season has been power. His .146 ISO is more than a hundred points lower than his career average. In the eighth he came up with a runner on and the Sox down one, and this time he came through. 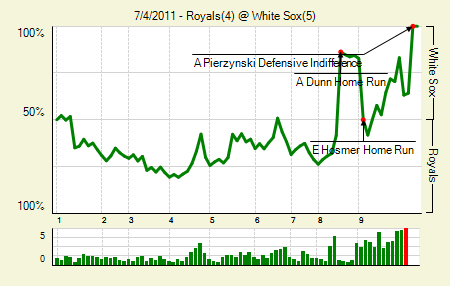 It wasn’t a typical Dunn gargantuan smash, but it cleared the fence nonetheless, giving the Sox a 4-3 lead. The lead wouldn’t last long, as the Royals tied it in the ninth, but the Sox won it in the bottom half…on a walk-off balk. Eric Hosmer: 2 for 4, 1 HR. He hit the solo shot that tied the game in the ninth. Paul Konerko: 2 for 4, 1 2B. It’s hard to imagine what the Sox would have looked like had Konerko signed with the Diamondbacks this past winter. Moving the Needle: Daniel Murphy puts the Mets ahead with a double, +.180 WPA. The Mets fell behind 2-0 earlier in the game, but in the sixth they mounted their comeback. A single and sacrifice (by the pitcher) set things up, and a trio of doubles by Angel Pagan, Carlos Beltran, and finally Murphy gave the Mets three runs and the lead. They’d then tack on two in the eighth for good measure. 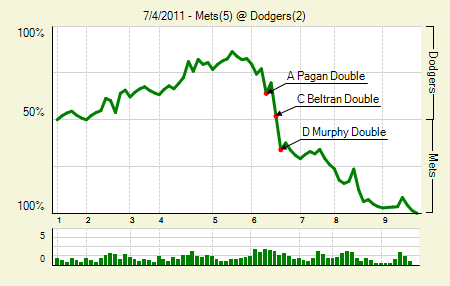 Angel Pagan: 2 for 5, 2 2B. Even with his 0 for the series against the Yankees he’s still 10 for his last 27 with five doubles and four walks. James Loney: 2 for 4. He drove in both Dodger runs, and his wOBA has cleared .300. 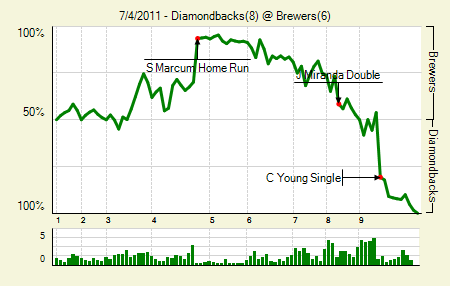 Moving the Needle: Chris Young singles home the go-ahead run in the ninth, +.345 WPA. The Diamondbacks had plenty of coming back to do in this one. They allowed two homers in the fourth, one of them a grand slam to Shaun Marcum, making it a 6-1 Brewers lead. But the DBacks got right on the task, getting a run in the fifth and then two more in the sixth. They kept creeping from there, getting one in the seventh and then one in the eighth to tie it at six. In the ninth Young came up with a runner on second and lined one just in front of Nyjer Morgan in left, bringing home the run and giving the DBacks the lead. A stolen base led Young to score as well. Miguel Montero: 3 for 5, 1 HR. He drove in a pair in the comeback effort. Sean Burroughs: 3 for 5. They were all singles, but he did score twice and drive in a run. Plus, this is a rare opportunity to include Burroughs in a write-up. Casey McGehee: 2 for 4, 1 2B. He scored twice. Moving the Needle: Tsuyoshi Nishioka’s bases-loaded double brings home a pair, +.159 WPA. The Twins jumped out ahead early in the game, picking up four in the first three innings. The big hits came in the second, when they loaded up the bases with one out. On a 1-0 count Nishioka lined one down the right field line, scoring two and setting up runners on second and third. 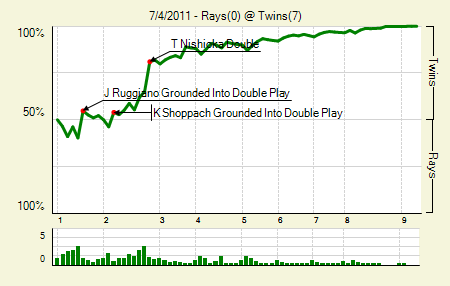 That resulted in another run, and a solo shot in the third gave the Twins a solid cushion. Brian Duensing: 9 IP, 6 H, 0 R, 4 BB, 7 K. I had typed that both the walks and the strikeouts were uncharacteristic of Duensing, but they’re actually reasonably in line with his overall numbers this season. That was the second complete game shutout of his career. Danny Valencia: 3 for 4, 1 2B, 1 HR. He led the way with three RBI. Moving the Needle: Alfonso Soriano brings home a pair with a two-out single, +.244 WPA. 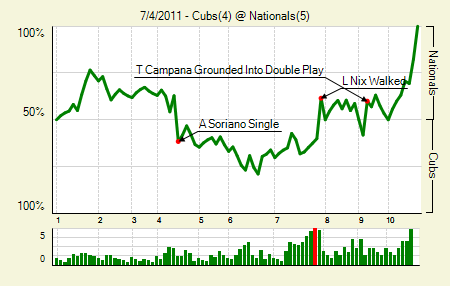 Down 2-1 in the fourth, the Cubs got a little something going with runners on first and third with one out. 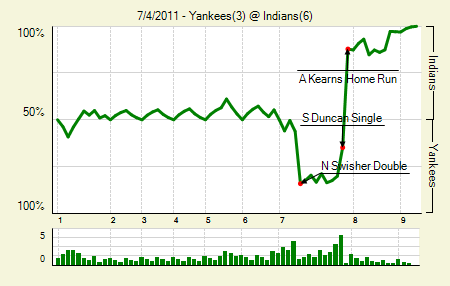 They failed on the first attempt to bring home a run, but Soriano succeeded with a single to center. It was enough to bring home both runners and give the Cubs a 3-2 lead. They’d extend that to 4-2 before the Nats came back to tie. The game ended in the 10th on a wild pitch. Laynce Nix: 2 for 4, 1 3B, 1 BB. He drove in two. Carlos Pena: 3 for 4, 1 3B. He drove in no runs with those three hits, which happens when the guys ahead of you go 2 for 19. Moving the Needle: Justin Smoak doubles home the go-ahead run, +.230 WPA. The A’s got out to an early lead, but the Mariners tied it in the sixth with a solo homer. Then in the seventh Brendan Ryan led off with a single and came around to score two batters later, when Smoak lined one down the right field line. 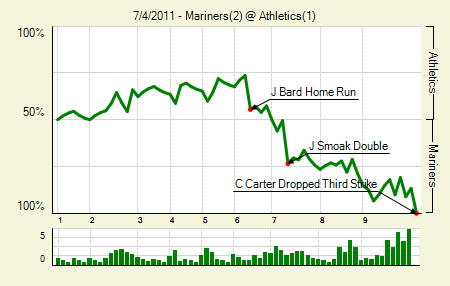 The Mariners bullpen took over from there, allowing a hit and a walk in the final three frames. Brandon McCarthy: 6.2 IP, H, 2 R, 2 BB, 5 K. It was his first start since May 18th, though he picked up right where he left off. Michael Pineda: 6 IP, 2 H, 1 R, 2 BB, 7 K. He was at just 91 pitches, so it does appear that the Mariners are taking a progressive approach to his workload. Moving the Needle: Chase D’Arnaud guns down Matt Downs at the plate, +.141 WPA. The plus and minus numbers on these plays are sometimes interchangeable, depending on how I phrase the play. 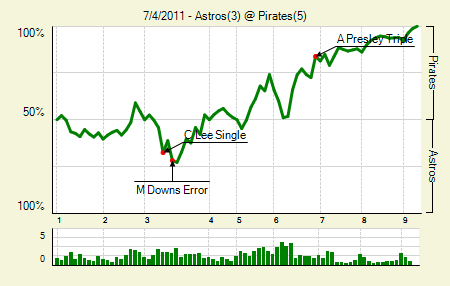 The play-by-play has it at -.141, since it hurt the batting team, but it was more a good defensive play. With runners on second and third and one out, Brett Myers chopped one to short, and D’Arnaud fired a strike home. The throw was so far ahead of Downs that he had time to stop and retreat to third. Michael McKenry, in fundamentally sound rundown manner, chased Down back to third, where the trail runner was already standing. No need for a throw there. That held the Pirates lead at 4-3. Alex Presley: 3 for 4, 1 3B, 1 BB. The walk was intentional. He is now 12 for 33 with a double, two triples, and a homer since his recall (.429 wOBA). Hunter Pence: 2 for 3, 1 2B, 1 HBP. He also had an excellent throw to gun down Josh Harrison trying to score. Harrison tried to plow the catcher, but it was he who was shaken up on the play. Moving the Needle: Endy Chavez homers to break the tie, +.158 WPA. 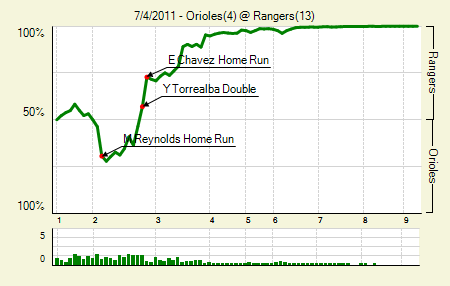 The Orioles picked up a pair in their half of the second, but the Rangers answered big time in the bottom half. A double and a single (followed by an error) gave them their first run, and another double tied it. 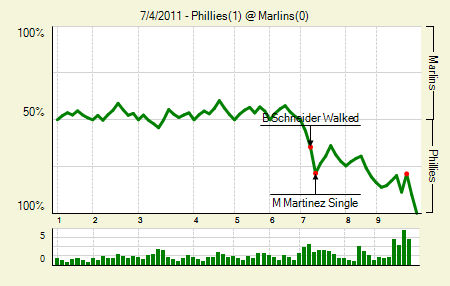 That brought up Chavez, who gave a mighty hack at an off-speed pitch and pulled it way out to right. That just started the Rangers run scoring. Chavez came back the next inning with a two-RBI double . Michael Young: 3 for 4, 1 2B, 1 3B. Bah, homer short of the cycle. David Murphy: 3 for 5, 1 2B. He scored all three times he reached. Mark Reynolds: 2 for 4, 2 HR. His slow start is way behind him. He now ranks eighth in the majors in ISO. Moving the Needle: Mark Hamilton’s single drives home the game’s only run, +.269 WPA. Before the eighth the Cadinals had gotten a runner to second just once. In this one they got a guy all the way to third with two outs, and Hamilton came through with a single to drive him home and finally put a run on the board. Chris Carpenter: 8 IP, 6 H, 0 R, 1 BB, 3 K. At 120 pitches, he had done more than his share of the work. In his last three starts he’s gone 24 IP, 18 H, 2 R, 3 BB, 15 K.
Johnny Cueto: 8 IP, 6 H, 1 R, 3 BB, 0 K. His insane season continues, as his ERA is down to 1.77. He still hasn’t allowed more than three runs in a start all season, and has allowed more than one just once in his last five starts. 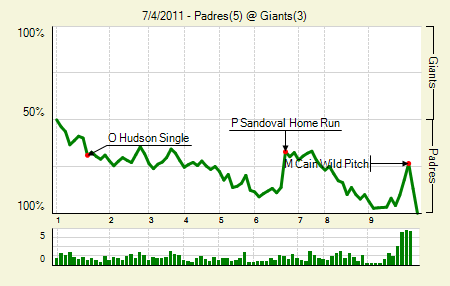 Moving the Needle: Pablo Sandoval’s homer brings the Giants to within one, +.191 WPA. The Padres took a quick 2-0 lead in this one, and then made it 3-0 in the fifth. In the sixth the Giants cashed in when Sandoval hit one out into McCovey’s Cove to make it 3-2, but that’s as close as they would get. The Padres tacked on a run in the eighth and another in the ninth to take it. Will Venable: 2 for 5, 1 HR. He, too, hit one into the Cove. Clayton Richard: 5 IP, 2 H, 0 R, 3 BB, 2 K. He was the unfortunate victim of being a pitcher on the road in the NL. With a runner on second and one out in the top of the sixth, they decided to pinch hit for him. We hoped you liked reading The Morning After: Game Recaps for July 4th by Joe Pawlikowski! Travis Snider wasn’t in the minors because he was hitting badly (which he definitely was), but to work out his swing without the pressure of the MLB. It took a lot of time, but now his swing seems to be “healthy” again. AA knows the Jays aren’t competing, that’s not why they sent Travis (or Brett Cecil) down.